Read the full poem, click here. Visit the National Libraries Day website to learn more! "Nadine Lipman of the Waterford (CT) Public Library, and Caitlin Augusta of the Stratford (CT) Library Association have started a grassroots initiative called “Take Your Child to the Library Day.” The annual event will be on the first Saturday in February (February 4, 2012). They've set up a blog at: takeyourchildtothelibrary.blogspot.com, and a public Facebook page at facebook.com/Take-Your-Child-to-the-Library-Day/286965. Everyone is invited to participate, including libraries outside of Connecticut." Note: the lovely artwork for Take Your Child to the Library day was created by children's author Nancy Elizabeth Wallace. We have plans to help spread the word and more people involved, it's on our calendar for 2013! 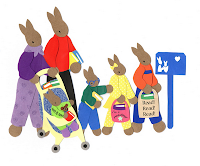 Wouldn't it be lovely if EVERY day was Take Your Child to the Library Day? tell them the Books for Walls Project sent you. So much to celebrate. Thanks for the work. --Friend from across the pond.